League of Legends: Supremacy – is this Riot’s prototype Hearthstone competitor? Riot president Marc Merrill wasn’t himself last night. A hacker relieved him of his Twitter account, and proceeded to post pictures of “one of the many prototypes” Riot have experimented with – a digital card game named League of Legends: Supremacy. 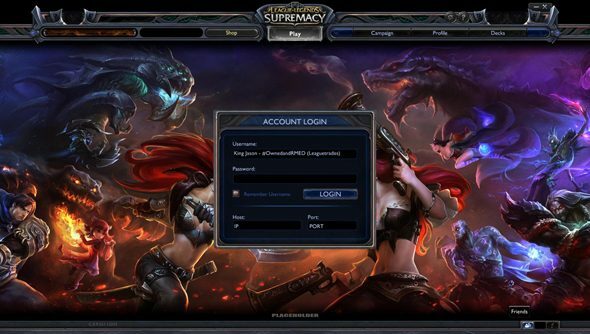 The hacker behind the elaborate codename ‘Jason’ posted an image of the placeholder login screen you can see above, which features links to a Campaign mode, player profile page and ‘Decks’ screen – as well as a Shop, the means by which Riot would presumably break even in tried and tested free-to-play fashion. The name Supremacy will be familiar to some: it was first registered by Riot last year. Speculation at the time led some to expect a new mode within LoL, but our new friend Jason claims to have the server and client source for a “standalone game”. He then leaked two imgur galleries’ worth of blank card templates and text icons, the latter of which have since been removed. Apparently drunk on socially-mediated power, Jason threatened to release a 200 MB file of card images, “unless Marc Merrill emails me not to”. Merrill must have swiftly composed a draft artful enough to talk Jason down, because the hacker soon relinquished control of the account. This is the real Marc. Account’s back in my hands. Protip: use login verification on Twitter, don’t be me and use a super old password. “Yup, someone got onto my Twitter account,” wrote Merrill a short while later. “Yup, someone shared some old screens from one of the many prototypes we’ve experimented with. Oh, but please can it, though? I can’t think of another PC developer besides Blizzard better positioned to put together a world-conquering TCG – and the strain this site’s been under for the last few days of Hearthstone beta key giveaways is testament to the demand. I’m sure a hacker’s conception of a “completed” game differs from Riot’s own exacting standards – so perhaps Supremacy isn’t ditched at all, but still under the hammer?